I just returned from a scary gathering of climate deniers at the uber-conservative Heritage Foundation. It was for a presentation by FOX News columnist and pollution-industry lobbyist Steven Milloy, to promote his new book, Green Hell: How Environmentalists Plan to Control Your Life and What You Can Do to Stop Them. While solutions we're exactly on the table ("I can't give away everything. 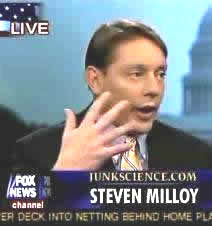 I want you to buy the book"), Milloy was full of accusations that organizations like the U.S. Green Building Council are the "facist/communist/Nazi" block that are pushing a dictatorship of environmentalism that will be promoted by Obama and Congress to create policy loopholes and tax incentives. These will then line the pockets of environmentalists, politicians, and big business, while forcing consumers to pay higher prices for all their purchases. Milloy accused Al Gore of spending $600 per month to heat his pool. Not to nitpick, but I doubt Gore spends that much to heat his pool in the Tennessee summer months. One audience member (the audience, incidentally, looked to be about half with Milloy and half against, including one vocal person dressed as a polar bear) asked him about his connections to ExxonMobil, Chevron, Phillip Morris, Dow Chemical, and a litany of heavily-polluting corporations. Milloy deflected the question without offering a convincing explanation. No substance was the sickening theme of the talk. He cited some 31,000 scientists in the U.S. who don't think climate change is caused by humans. But he didn't mention the name or affiliation of even one of those scientists. His most interesting points related to how conservative groups are up against a mighty challenge from the greenies. He claimed that both the Environmental Defense Fund and the Natural Resources Defense Council have greater assets than the "top conservative think tank, the Heritage Foundation." He said right-wingers have lots of think tanks but need more activist groups, like the lefties, to influence more Republican Congressional leaders to step back from all this "green stuff." I walked away pretty sick to my stomach thinking how Milloy manages to live with himself. Was he suggesting we all buy Hummers? Was he suggesting that care for the planet and its people is somehow not aligned with freedom? Was he simply profiteering from the fact that nobody else is crazy enough to combat the scientific wisdom of every reputed climate expert worldwide? C-SPAN's irresponsible coverage of the event (as well as mine?) definitely confirmed that there's still a spot for anyone with a shocking, if unsubstantiated, opinion within the news cycle. Luckily, the nervous (his hands were shaking prior to speaking) and beady-eyed Milloy is no intellectual match for the likes of Gore and Van Jones. Let's hope the clean-energy argument finds a few more well-articulated spokespeople to join in a chorus that is helping make real human progress. For now, the right continues to remain brain dead. Since when is Al Gore "intellectual"? I know nothing about Miloy but a house plant would have an unfair advantage over Gore. He's no scientist and the alleged science that he spews is easy to discredit. He's simply preaching to the crowd of the anthropogenic global warming religion so nobody bothers to wrestle him on it. They wouldn't want to know the answer. Hmm. I tend to listen to the scientists on this one. And Al Gore just happens to agree with 98 percent of them. I from China. I like Al Gore. We build one new coal burning power plant every 3 weeks. You Americans so stupid, hahahaha. Please to go ahead and destroy your own industry. We happy to sell you all the products you need. No limits on CO2 in China! Chairman Mao would be proud. He want to bring down America. Now you do that to yourselves. Thanks for you saving the planet! Life good, many jobs in China. Many more you sending our way. Remember, your CO2 = Bad for planet, Our CO2 = good for China.